Good People is a nice, little story in Alabama. It’s a solid micro-brewery with strong ratings on BeerAdvocate and a small, but devoted following in the Yellowhammer state. Founded in 2007, the brewery’s timing was impeccable. ‘Bama used to have notoriously antiquated laws pertaining to beer. It was formerly illegal to sell beer at 6% ABV or higher which essentially made most of the best beers in the world impossible to obtain in the state. Thanks to a grassroots campaign called Free the Hops, this issue was brought forward to the state legislature. Of course, nothing is that easy in Alabama and it took years for the campaign to gain traction. In one particularly famous incident, a less-than-brilliant state legislator was quoted as saying “What’s wrong with the beer we got? It drank pretty good, don’t it?” Yes, he seriously said that. Thanks to the Free the Hops folks, thousands of beer drinkers in the state started protesting the ridiculous laws and in May of 2009, a new law allowing beer up to 13.9% ABV was passed (this allows all but perhaps the 50 strongest beers on Earth to be sold in ‘Bama). 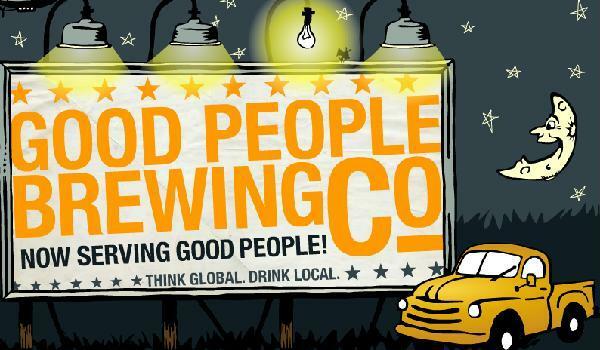 By then, Good People was well established and was ready to jump in as THE local craft brewer in the Birmingham area (the hub of the Free the Hops movement and Alabama in general). They have since expanded their offerings, tackled some challenging styles (such as a Roggenbier and Oatmeal Coffee Stout), and have proven themselves to be worthy champions of craft brewing in a state desperate for local ale-makers. Good People’s flagship is their highly drinkable American Brown. I had it on tap in a shaker glass and it poured a clean, chestnut brown with just a hint of red along the edge of the glass. The head was tan…darker than I would expect from a straightforward brown ale. The head lasted quite awhile…it’s off-white, tightly-knit and leaves excellent lacing when it finally dissolves. The aroma was malty of course, with a touch of caramel and pecans…but a very healthy dose of hops balanced it out. A visit to the Good People site notes that the beer has Cascades and Willamette hops (two of the most widely used American varietals) and their presence is unmistakable. The taste of the beer matches the aroma…a good, well-rounded sweetness that is cut by the pleasant bitterness of the hops. Neither taste dominates the other and they stay in harmony even as the beer warms (though the beer didn’t stick around long enough for that to be a problem). This is a no-doubt session beer with high drinkability. It’s the kind of beer you could sit around all night with as you discussed the inanity of Birmingham politics, the chances of the Tide to repeat, or where to get the best barbecue in town (the answer: Moe’s). The American Brown is nothing fancy…just a well-built brown ale designed to get the job done. It’s not as rich or complex as a Trappist or big, bold Imperial Stout, but it’s not supposed to be. It’s a fine example of its style and a highly drinkable brew and for that, the good people at Good People deserve 3 Hops for this delightful little ale. Posted in Ale Factories, Tasting Notes.Tagged Brown Ale, Good People, session beer. Not to step on your toes, but I figured you would want the website to Free The Hops posted somewhere. There’s still too many damn restrictions on alcohol content across the country and it only applies to beer. The freakin’ three-two law (3.2% alc. by weight, 4.0 ABV) still exists in many parts of the Midwest and that limits where good beer can be purchased. In many areas the state controls the distribution of higher alcohol beers, which in turn limits the selection of what should be universally available brews. It’s okay to buy a pint of cheap vodka at a gas station, but 10% ABV Imperial Stouts should be regulated since people just won’t know what to do with them. Gotta protect society. Makes sense.